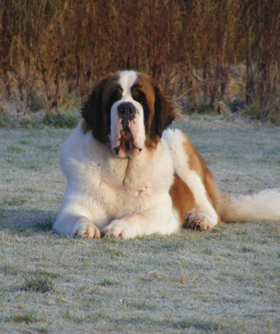 Our first involvement with the wonderful breed of Saint Bernard’s began in 2000 with the purchase of our first Saint Bernard Puppy whom we called "Sailor". Our two children were both young at the time with our youngest being only 18 months old. Sailor became the third “baby” of the family. His devotion to us and our devotion to him was unquestioned. He was playful, loyal, and clever and acted like a personal bodyguard to the children, instinctively knowing if they were wandering somewhere they shouldn’t and making us aware of it by barking and dancing around. Sadly after a short illness Sailor passed on in January 2009 but will always stay in our hearts. Sailor instilled us a love for the breed that has continued over the years and we are fortunate to have been able to breed some wonderful dogs. We pride ourselves on endeavouring to breed healthy, quality dogs, fit for function and to the breed standard. We are the only Irish Breeders of Saint Bernard’s to have ever achieved multiple CC’s and two Best of Breeds with our own breeding at Crufts. An achievement that we as breeders take great pride in and certainly one for the history books. Copyright © Bulabos 2019. All rights reserved.